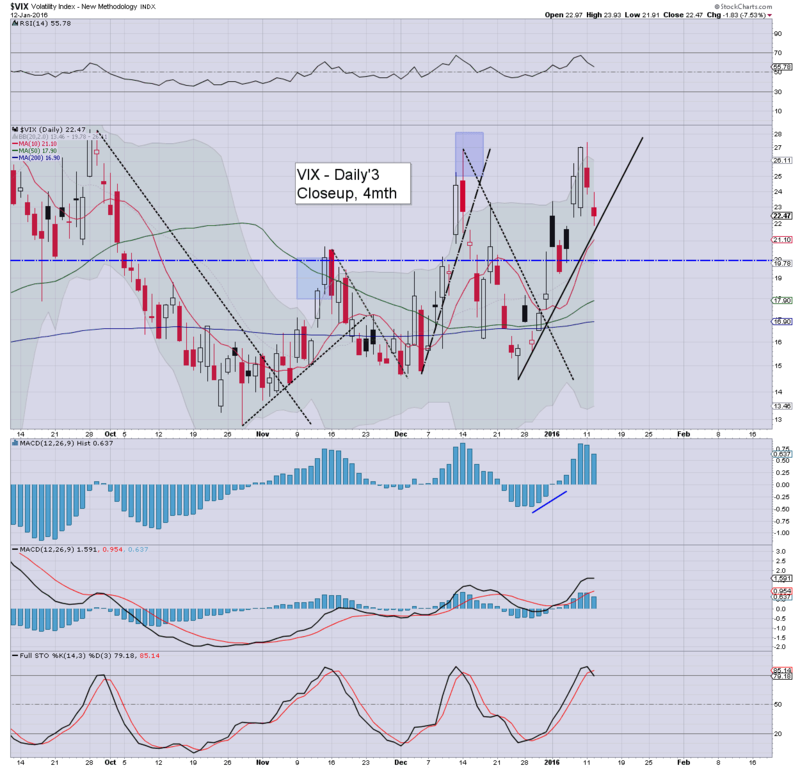 It was a day of swings for equities, and it was notable that despite the indexes turning negative, the VIX never turned green, settling -7.5% @ 22.47. Near term outlook offers further equity upside to the sp'1970/90 zone, and that likely equates to VIX <20. Most notable aspect of the day was indeed the VIX. Despite equities swinging from sp'1947 to 1914, the VIX stayed negative. 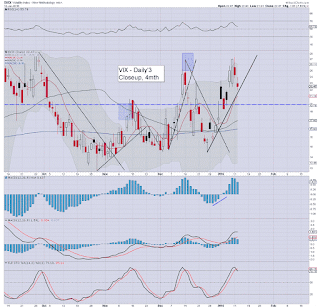 Sub VIX 20s look due.. with sp'1960/70s. If 1990s, then VIX could cool to the 18/16s. 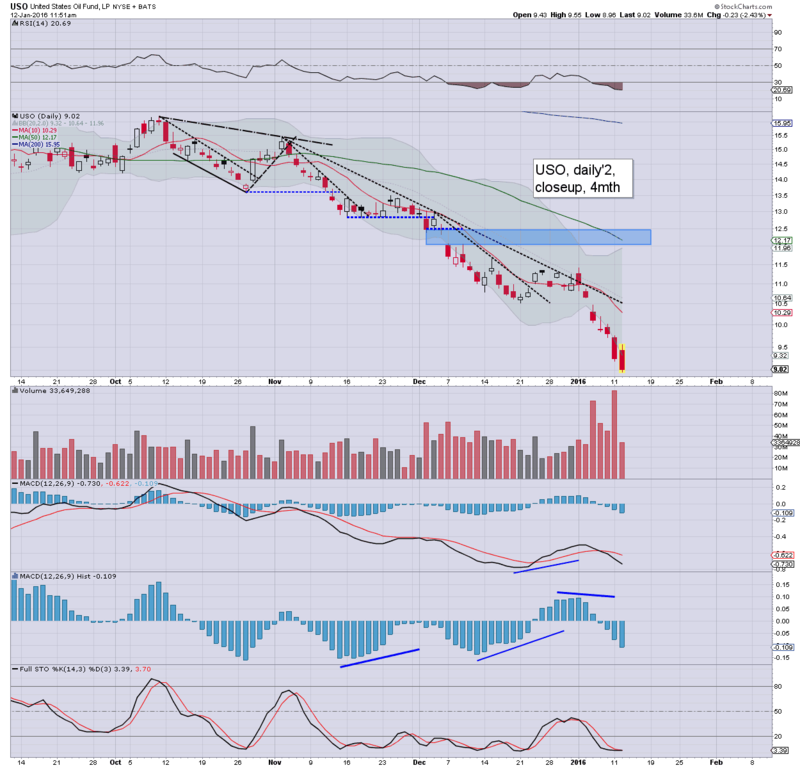 *I've eyes on TVIX-long... but not until next Tuesday... probably from the $6.00s, with VIX 18s or lower. *closing hour action: along with the 2pm candle, the 3pm candle was very definitive, confirming the baby bull flag. 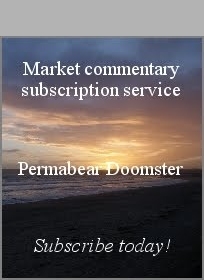 A day of rather significant swings, and no doubt many were spooked by yet another failure for the market to hold opening gains. 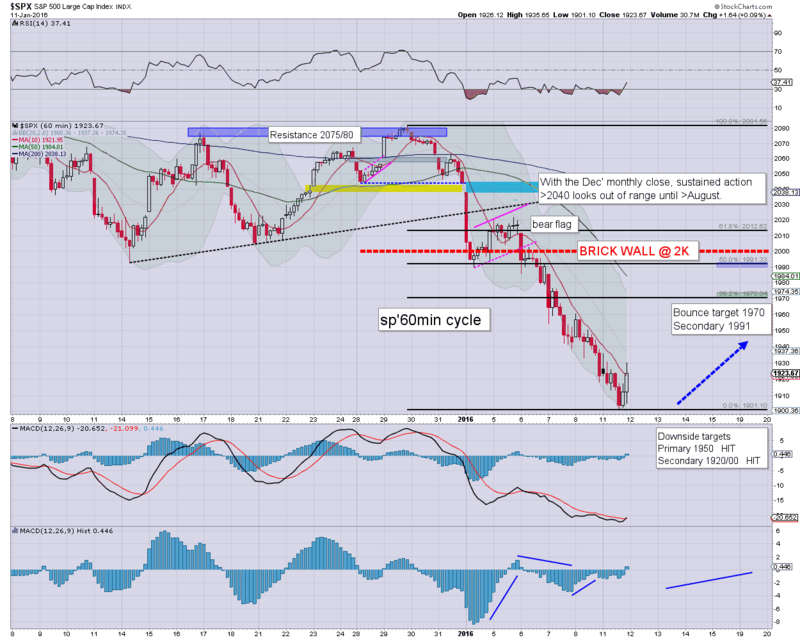 Price action/structure though is different, as we're now consistently trading above the hourly 10MA. 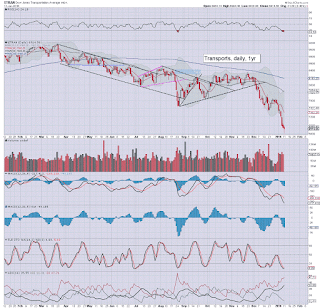 The sp'1950s look highly probable tomorrow... with 1970s due before the long 3 day weekend. yours truly remains in patience mode.. waiting like a sniper on the side of a mountain, for the 1970/90 zone to reshort. 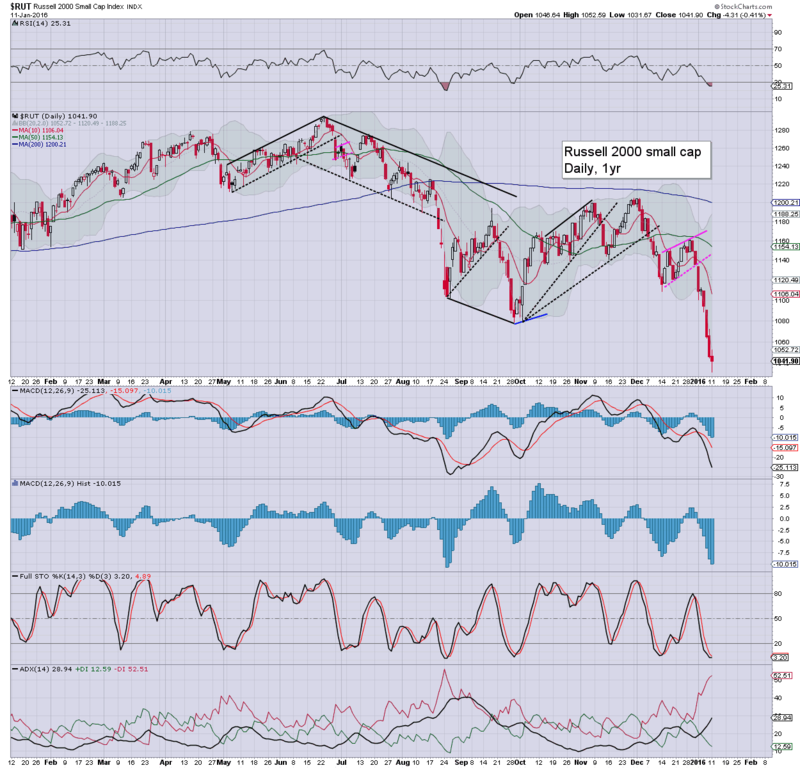 US equity indexes are making a push to turn back positive, as the baby bull flag looks set to play out. By definition, the sp'1950/60s will be viable tomorrow/Thursday. First target of 1970 looks viable this Friday/next Tuesday. New for Oil of $29.93... but currently rebounding >$30. An interesting day in market land.. one where experience does actually count for a lot. TVIX -4.5%... crazy intraday swings today. 3.30pm.. sp +14pts @ 1938... and no doubt the bears are getting short-stopped again. The 1970s are due... although look out of range tomorrow. More viable on Thurs/Friday. 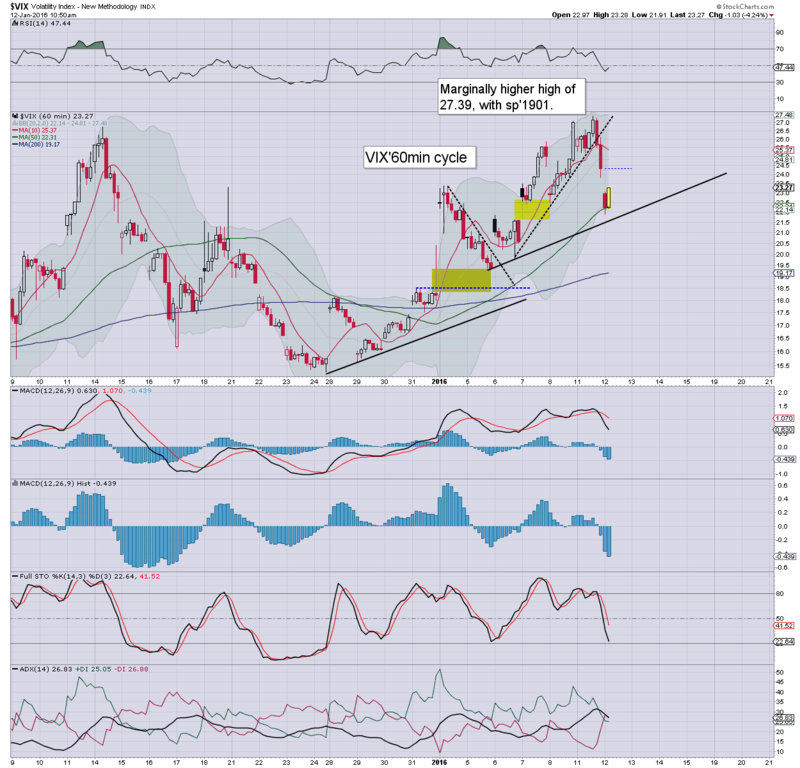 TVIX -8%... back to the opening level. What a day ! US equities continue to be choppy, remaining well below the early high of sp'1947. 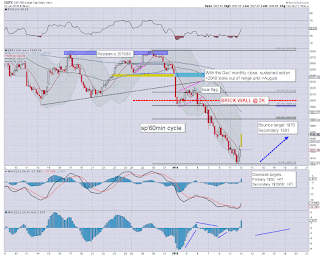 Price structure is a clear baby bull flag, with the 1950/60s probable tomorrow/Thursday.. along with VIX <20. 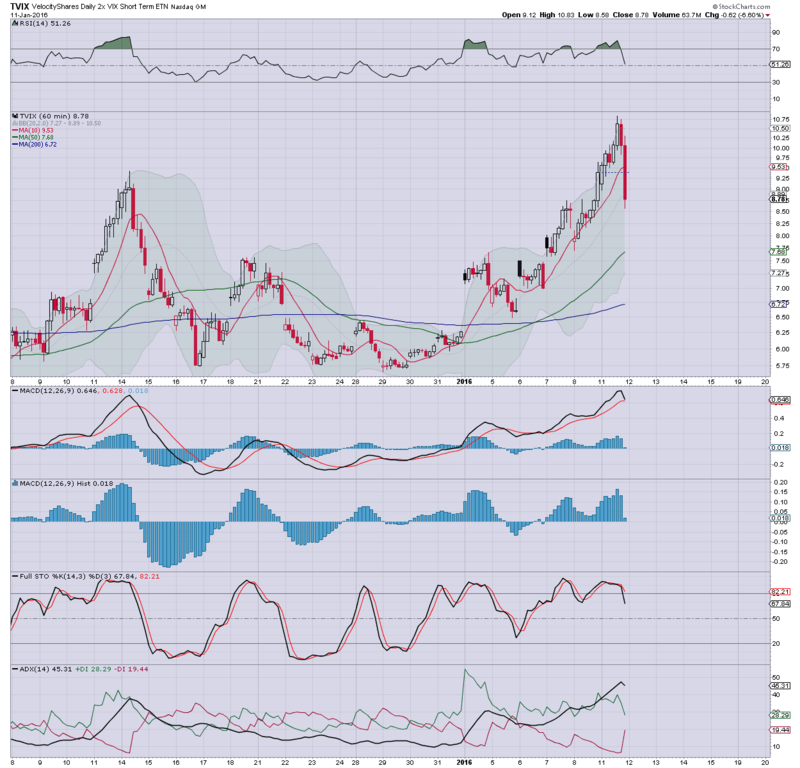 WTIC Oil is battling hard to hold the $30 threshold, so far reaching $30.06. 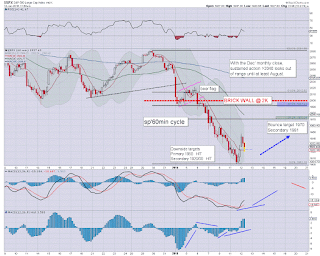 *fractional new cycle in the second market leader - R2K. 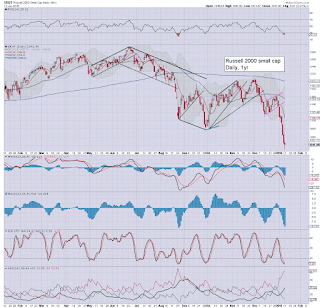 Despite a new low in the R2K, the broader market still looks vulnerable to new upside. Price structure is pretty clear... we'll resume strongly higher tomorrow.. as bears trying to short the market today, will have to cover. *amusing to see the cheerleaders on CNBC - not least Stephanie Link... even she admitted 'I don't have an idea why we opened higher'. Yeah Steph'.. you just don't understand.... and no matter how sincere you look at the camera, I ain't buying GPRO or TWTR just because they lost the $20 threshold. It remains a rather fierce battle, but the equity bulls still look set to win this round. 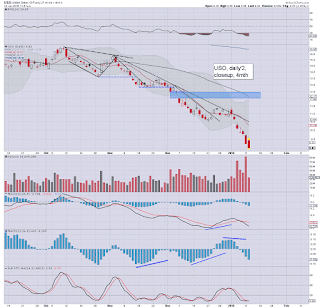 First target remains the sp'1970s. 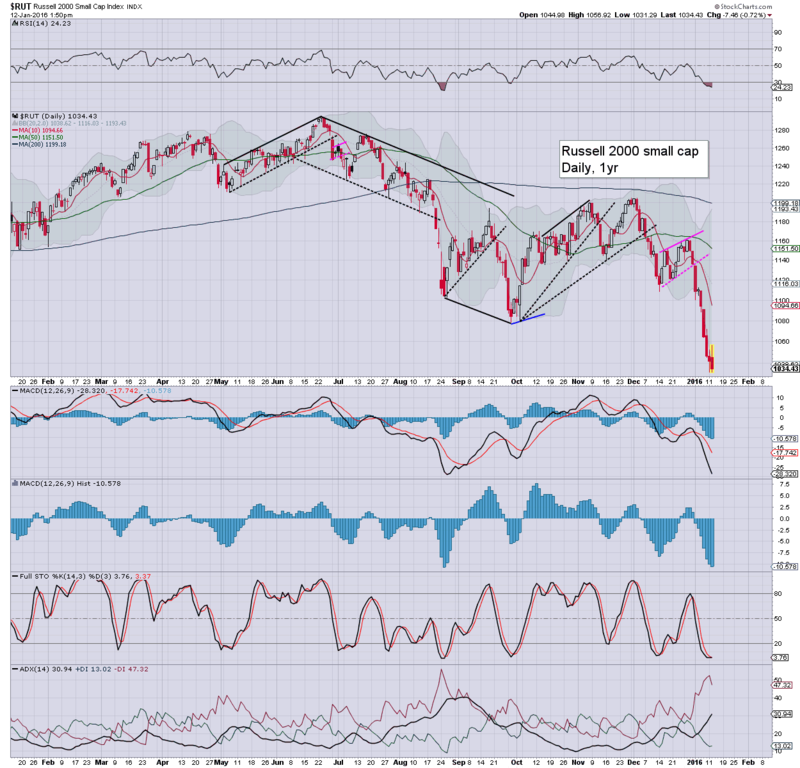 Considering the decline from sp'2081 took around 8 days, the current rally from 1901 will likely take 3-4 days... taking us into opex-Friday/next Tuesday. 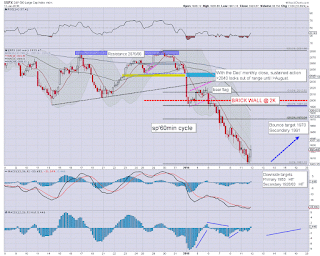 Price action/structure look bullish in the near term... but it merely sets up a big bear flag for late January. There are a truck load of dynamic movers today... esp' in energy/mining land.. 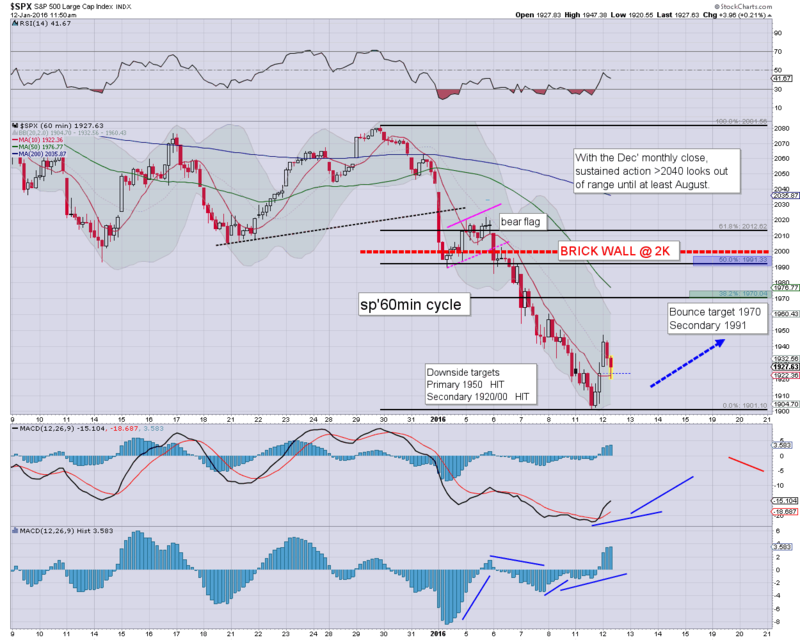 Despite some indexes turning negative, underlying price pressure is likely to favour the equity bulls into next week. Nothing has changed, first target remains the sp'1970 threshold, and that should equate to VIX 19/18s. If sp'1990s.. VIX looks vulnerable to 17/16s. *Oil is -2.3%, the $30 threshold is currently being tested. If fails.. next level is not until $25. No doubt a fair few will be real confused at the current price action. Another failed rally.. same as before? Price action/structure is different... and I see no reason to drop the upside target. The opening gains to sp'1947 have largely evaporated, but the Monday low of 1901 still looks very secure. Price structure into early next week is likely to become a rather large bear flag, and that will open much lower levels into February. 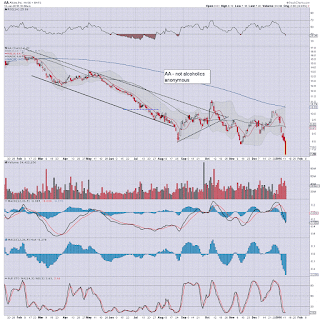 *Oil -1.7% in the $30s.. and that is not helping the market mood. So.. renewed weakness, but yesterday's low should comfortably low. The daily equity/VIX cycles will remain against the bears into next week. Despite the weak 10am hour, I have no concerns that I am missing out on the next down wave. The market is not buying the rather twisted earnings report. 11.26am... sp' +1pt @1925... a clear 1% below the earlier level. *notable reversal.. TVIX.. from 7.90 to 8.80s.. back at evens. 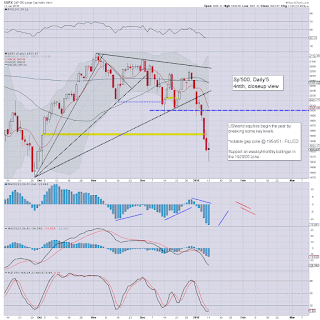 US equities open moderately higher, and are already in the sp'1940s. First target remains 1970, and that looks a given, whether by Friday/next Tuesday. VIX is naturally continuing to cool, -9% in the 21s. Oil is bouncing, +2.2% in the $31s. Gold -$10. Near term outlook is pretty clear, right? 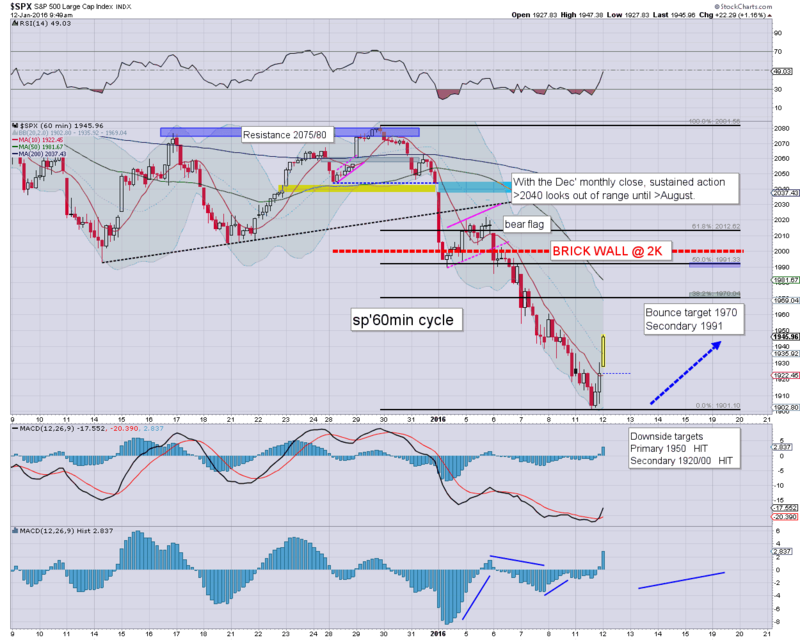 ... whilst keeping in mind the bigger bearish weekly/monthly cycles. yours truly is more than content to watch this nonsense climb to the 1970/90 zone... at which point it will be time to hit some buttons again. For those of you long from the 1920/00 zone.... congrats.. and enjoy the ride higher. Good morning. US equity futures are moderately higher, sp +17pts, we're set to open at 1940. 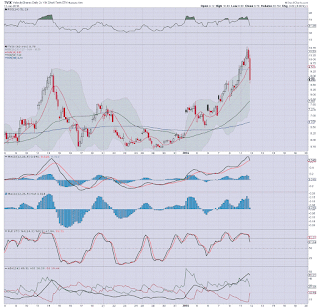 USD remains broadly strong, +0.3% in the DXY 99.00s. Metals are cooling, Gold -$8. Oil is vainly bouncing, +1.4%. Indeed, we have a short term floor of sp'1901... and we might even hit the 1950s today. The 1970s are an easy target... with 1990s more viable next Tue/Wed. 8.18am.. bears getting routed, sp +21pts... 1944. 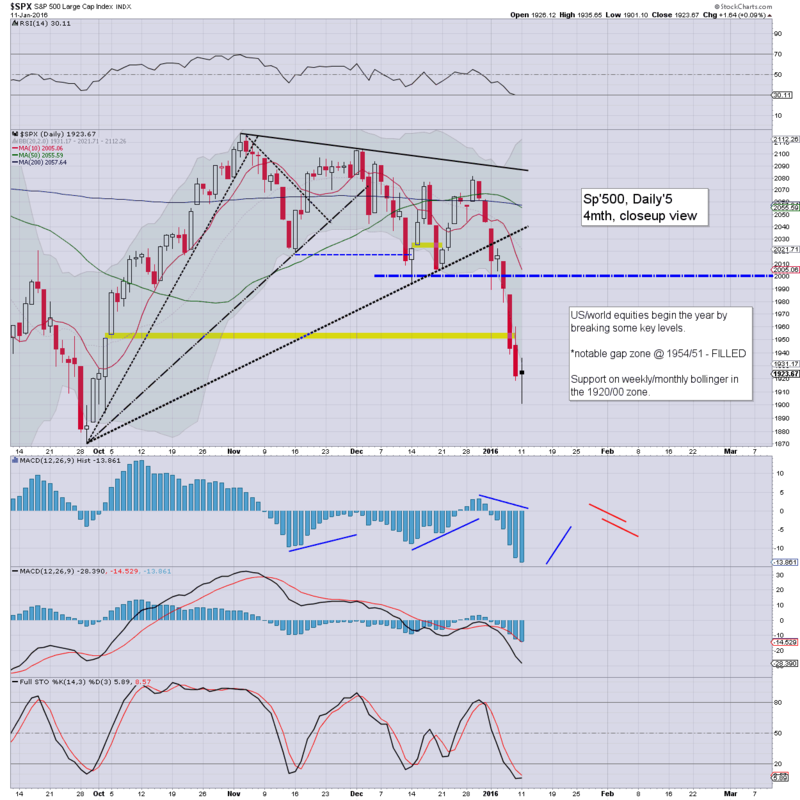 The sp'500 saw further weakness, but there is high clarity in a short term floor of sp'1901. 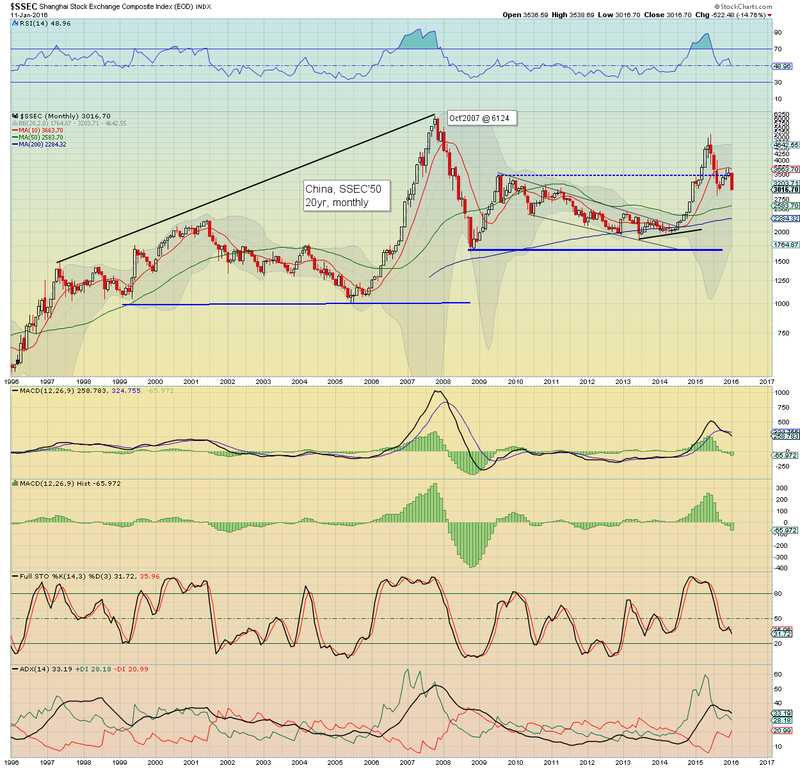 The market is set to bounce to the 1970/90s. Sustained action >2K looks out of range. 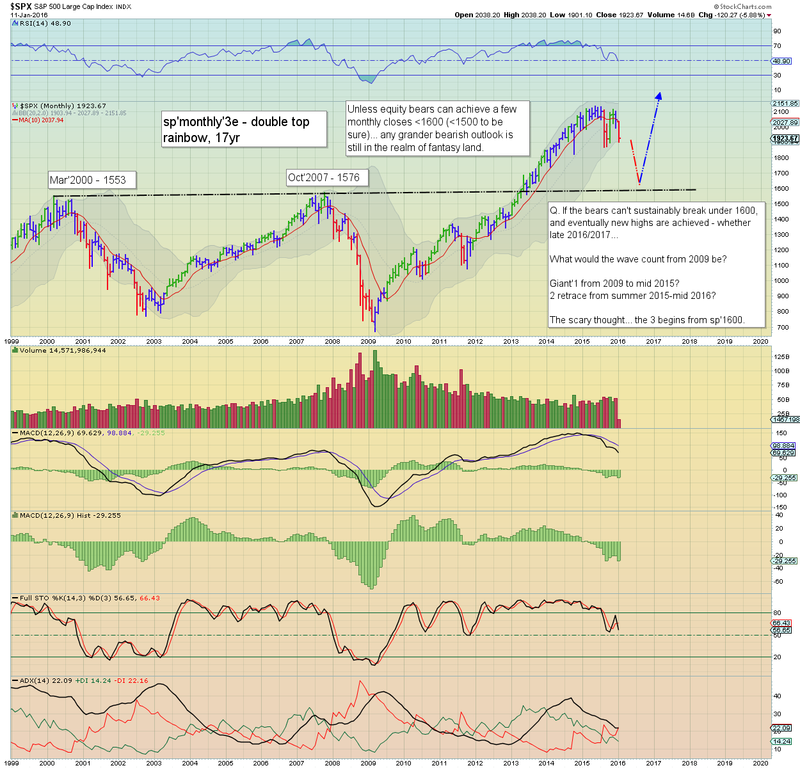 More broadly, there can be high confidence the sp'1600s are coming in the months ahead. re: US equities... short term floor... but clearly headed much lower. The sp'1600s look a rather comfortable target. 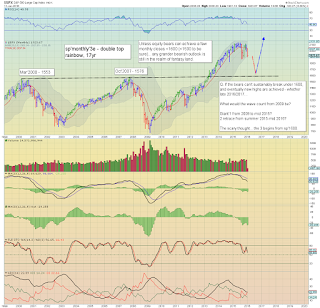 Based on the bigger monthly MACD cycles... prime downside would be April/May. 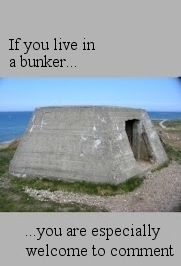 It could be sooner than that though. re: China. The big bear flag is playing out, as the Shanghai comp' is set to lose 3K, and then headed for the 2500s. Whether a full retrace to 2K... difficult to say. Tuesday has no econ-data of note. *Fed officials Fischer and Lacker will be speaking, and any talk of 'no rate hike again any time soon' (as Lockhart did today).. would certainly help to inspire a sustained bounce. I held TVIX-long across the weekend. Seeing the Sunday night futures recover from the equivalent of sp -18pts to pre-market gains of +13pts... yeah, that wasn't great viewing. I bailed early from $9.29... net 8% gain (from Thursday closing hour entry). Naturally, the market then saw another down wave, with TVIX pushing to $10.80s in the 2pm hour. From the above hourly chart, it should again be clear... the leveraged 2x or 3x ETNs (and ETFs) are wild things. TVIX imploded by almost 20% in the late afternoon, settling at $8.78, which is close to where I bought it last Thursday! No doubt the $7s are coming, maybe the 6s . Either way, I'll look to pick TVIX up again, when sp' is trading somewhere in the 1970/90 zone. US equities closed moderately mixed, sp +1pt @ 1923 (intra low 1901). The two leaders - Trans/R2K, settled lower by -0.5% and -0.4% respectively. There is high probability that the market has put in a short term floor, with viable upside into the next FOMC of Wed' Jan'27th. The 1990s remain best case for the equity bulls. 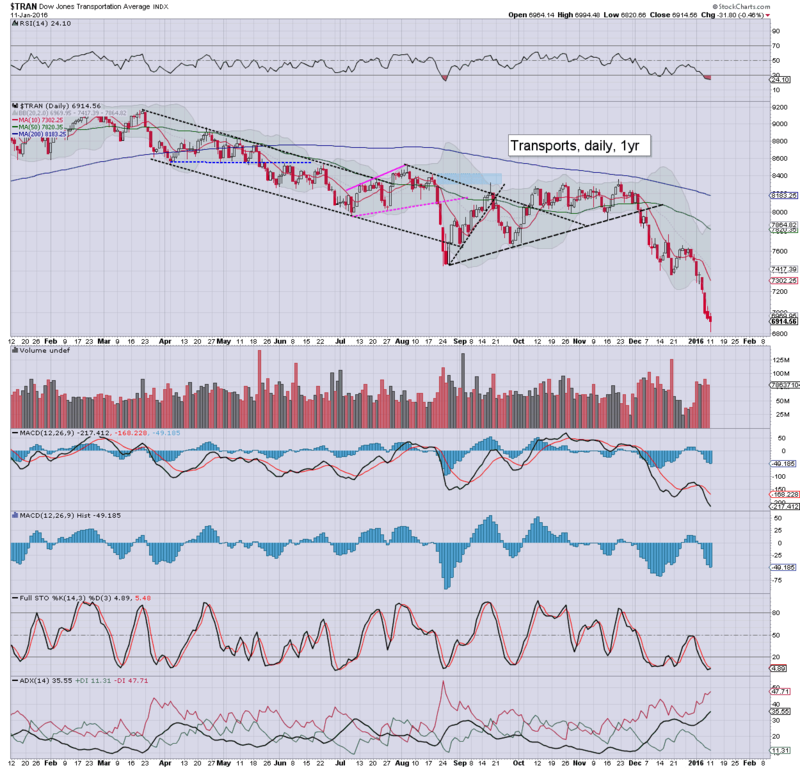 Trans - a new multi-year low of 6820... offering a spike floor. First upside target will be the 7400 level. Sustained action >50dma/7600s... looks out of range. 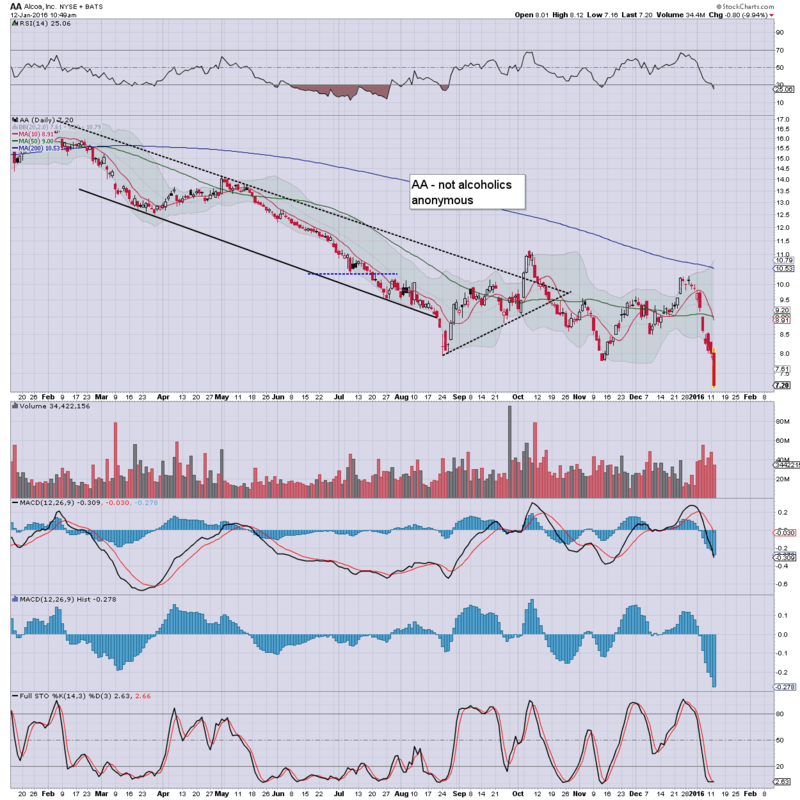 R2K - breaking the Oct'2014 low of 1040.. spiking from 1031. Viable upside to around 1100.. no higher than 1120s. 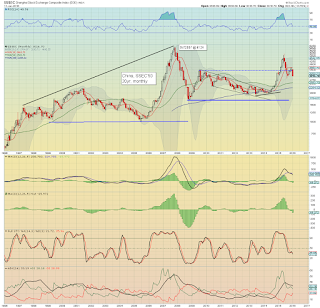 sp'500 - short term floor of 1901... set for 1970s... 1990s at most. No daily closes >2k for a long..... long time.